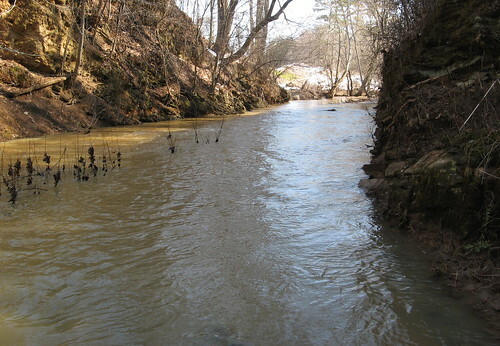 The mud’s deep enough to bury a Buick around here, so I decided it was as a good a day as any to stroll the length of the Salem Creek Trail, a four-mile greenway that starts at a shopping center on the west side of Winston Salem and ends on the east side at Salem Lake. 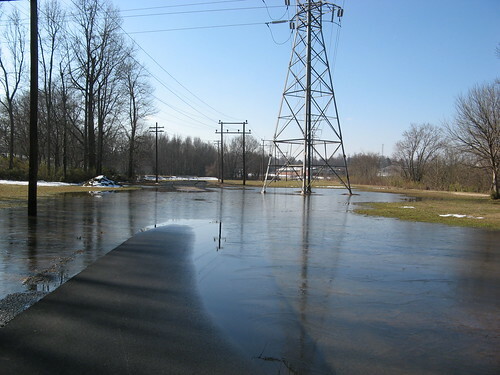 The trail has a lot going for it: almost entirely paved, passing through at least one construction zone, prone to flooding after strong rains, and home to a long line of utility towers. OK, so I was being sarcastic there. Like San Jose’s Guadalupe River Trail — strategically situated beneath a busy airport’s final approach — this greenway is only here because there was no profitable way to develop the land it passes through. 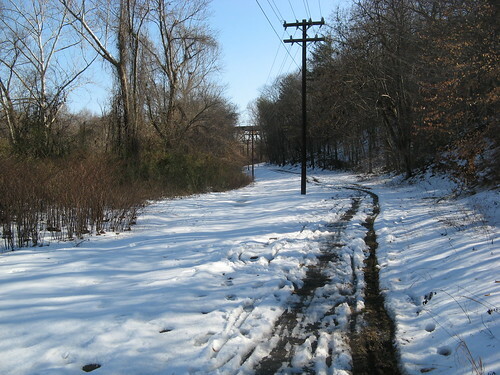 Power companies presumably acquired right-of-way for transmission towers along Salem Creek because it was a permanent geographical feature: not going anywhere, and not likely to be molested by marauding developers. The power towers are the scourge of the trail, I’ll admit, but there’d be no trail without ’em, I suspect. Such is life: so much compromise, so little free beer. Actually this was an objectively excellent day for a stroll in the outdoors. Sunny skies, mild breezes, the rest of the world squandering a perfectly good Sunday with the planning and execution of Super Bowl parties. Urban hikes are subject to the peculiarities of human nature, which has fascinated scientists for centuries, so the miles are never wasted. 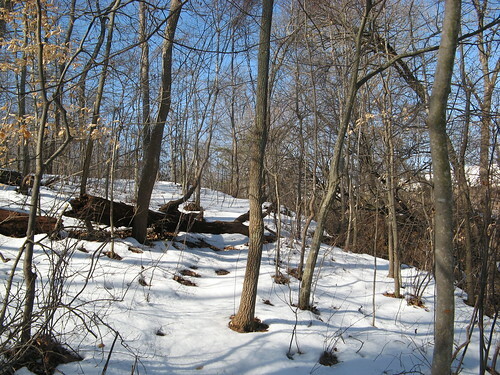 (Speaking of nature, I did see a couple robins — spring can’t be far away!). The trail offers many views of Winston-Salem’s tallest office tower, ingeniously designed to resemble an overinflated grain silo (a puzzling choice for tobacco country, if I do say so). 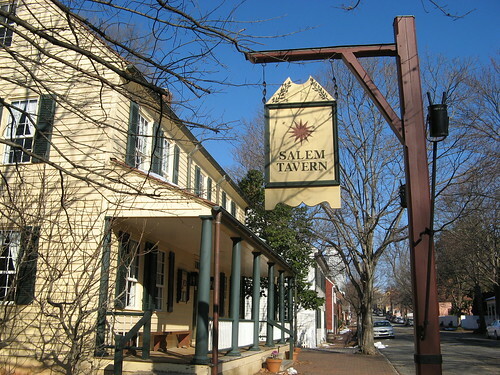 This is just down the street from Old Salem, a tourist destination commemorating the earliest settlers of this area, who set up shop along the Salem Creek not far from here. 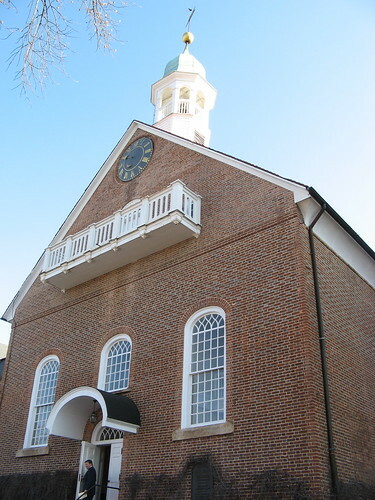 The settlers were the Moravians, whose structures I visited a couple months back at Historic Bethabara. 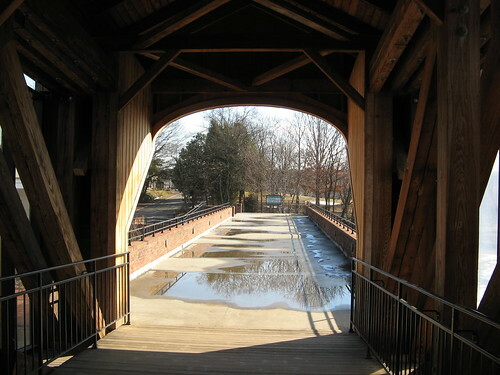 A large wooden walkway takes visitors into Old Salem. Melissa’s mom works here, so we always have the latest details on the inner workings of the place. We’ve promised to carry their secrets to the grave (mainly because people would embarrass us by changing the subject to things like the Super Bowl if we ever tried to air them in public. Not exactly a hotbed of sin and scandal, I’m chagrined to report). Somehow I think the early Protestants’ ideas of a tavern differ from our modern conceptions of one. I’m sure there was ale, for purely medicinal purposes, but no big-screen TVs or waitresses in very short shorts. People were singing inside the church. Actually there’s a lot to see at Old Salem — demonstrations of 18th century cooking, crafts, and textiles, among them. 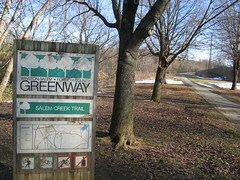 But I had my heart set on walking the full length of the Salem Creek Trail to Salem Lake. This seems like a good place to mention God had other plans for me. 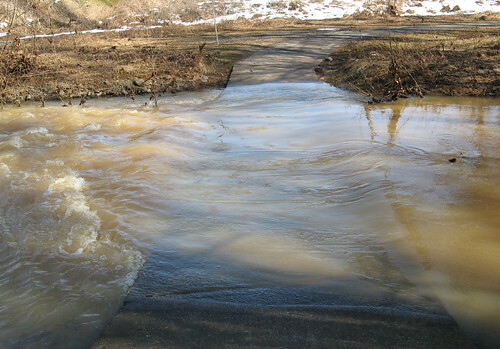 The first clue was this massive puddle blocking the trail. I gamely skirted the edge and trekked on. Quite a bit of snow remains in the shadier areas. 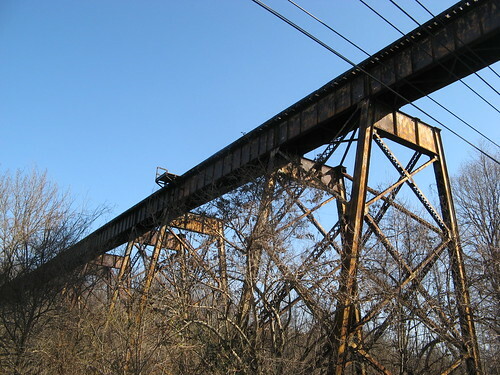 I always take pictures of old train trestles. Sorta the mechanical equivalent of dead trees. See those sticks poking up out of the water over at the left? That’s where the creek’s supposed to be. The trail resumes just around the bend at the upper right of this shot. I noticed a hill to my right and wondered if I could bushwhack around around the flooded section. The water isn’t that deep, but the current was pretty strong and besides, I didn’t see the point in soaking my feet twice (remember, I’d be coming back this way) on an urban hike. You might do that on general principles in the wilderness because it’s just a part of hiking. But in town it just feels foolish. So I ended up turning back about a half-mile from Salem Lake, which didn’t break my heart as I’ve been there before. All in all, a leisurely walk of about 9.5 miles (I added a mile and a half wandering around Old Salem). It’s all flat, but I’d rate it as moderate because anything over eight miles can be hard on the ol’ hooves. 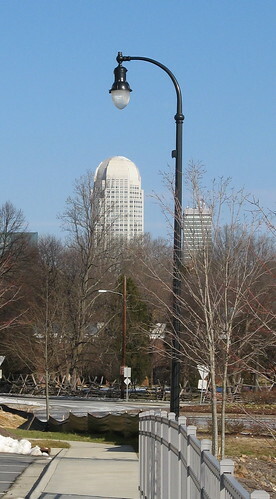 Winston-Salem Recreation and Parks page. Well, gee whiz, the mud around here is only deep enough to sink a Subaru.